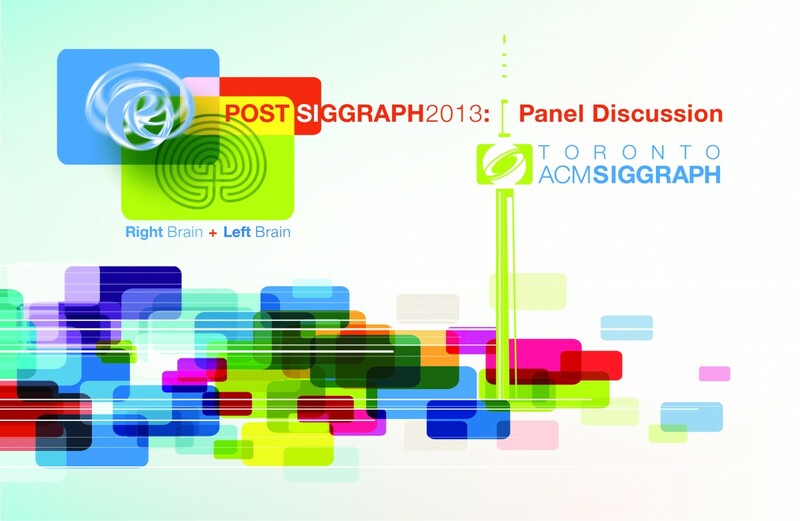 Post SIGGRAPH 2013 Panel Discussion A Success! Our Post-SIGGRAPH 2013 Panel Discussion was a success! In total we had 42 people in attendance and a fantastic line-up of content. Our Chapter Chair, Jacky Bibliowicz, hosted the event and spoke about what the Chapter has been able to accomplish over its first year and the recognition it has received from the ACM SIGGRAPH Chapters Steering Committee. Next, Mark Elendt, the Chair for the SIGGRAPH 2013 Dailies program, was introduced. Mark mentioned that he enjoys the Dailies program the most because it gives everyone in the SIGGRAPH community a chance to be heard. He also presented a few pre-recorded Dailies clips such as “The Octopus and the Geisha” by Edward Dawson-Taylor of EDJFX and “Take Shape” by students at Carnegie Mellon University’s Entertainment Technology Center. Mark will be chairing Dailies again for SIGGRAPH 2014. Watch the SIGGRAPH 2013 Dailies trailer to get a sense of what Mark presented. Robin King was the next at the podium speaking about the Computer Animation Festival. He spoke about how the first SIGGRAPH Video Review had only six technical shorts and it wasn’t juried. Robin shared with us some of the films he enjoyed such as the official trailer for FMX 2013 and the Best of Show film “A la française.” He also mentioned that in many cases he agrees with the SIGGRAPH Computer Animation Festival jury and in many cases he wonders what was going through the jury’s heads. Watch the trailer for the 2013 CAF and enjoy a few clips from the winning films. Next up was Alain Chesnais, who covered the Technical Papers program. Alain reminded us that SIGGRAPH started as a technical conference which then grew to encompass all aspects of computer graphics. He showed us part of the Technical Papers Preview video and then commented on three novel papers which he believes will have a strong impact in the next couple of years. Alain kindly shared his slides for us to view. The next speaker was Philippe Leblanc of Flixel Photos. Phil was a first-time attendee at SIGGRAPH and had a booth to promote Flixel in the Exhibition Hall. Phil briefly showed us what his company is about and mentioned the strategic partnerships he has developed since Flixel got started. Then he described some of the challenges he faced in putting the booth together and how he had to change what he was hoping to display once he arrived at the space. He mentioned he will do it again next year with a bigger team in order to get a chance to see more of the conference. Our final speakers were Sukhmani Kaur and Nicolas Gonzalez. Nico spoke briefly about SIGGRAPH Student Services, or “S3″ and invited the audience to participate in the S3 Talks that are hosted regularly online. Sukhmani was a first-time student volunteer (SV) and she is clearly passionate about the program. She spoke about how much fun she had volunteering at some of her shifts and how she even volunteered to stay longer because of how much she was enjoying herself. She also mentioned how meeting people at the conference then led to her being invited to visit a number of animation studios such as Pixar and The Mill. She encouraged all students to find out more and apply to the SV program at SIGGRAPH. LEGO Alain kept all of the speakers company at the podium during their talks. After the presentations were finished the speakers were invited to the stage for a question and answer session. Topics discussed included reasons why the Exhibition seems to be getting smaller but the other programs seem to be growing, what were the speakers’ favorite parts of the conference, and how to get involved and volunteer at the conference as a non-student. The speakers encouraged people to volunteer with our Toronto Chapter as well. If you are interested in volunteer opportunities, please don’t hesitate to contact us! Our Founding Sponsor, Side Effects Software, was present and provided a few T-shirts and other give-aways to our audience. Another set of T-shirts to give away was generously donated by Autodesk. Afterwards, the panelists and audience members headed over to Dundas Square to connect in a more social setting and exchange business cards. The audience was very happy with the content shown by the panelists. It was a very fun evening indeed! We have posted photos of the event on our Facebook page, and, while you are browsing, please Like our page. Follow us on Twitter too! On behalf of Your Toronto ACM SIGGRAPH Chapter, we’d like to thank all our Speakers, Members, and Volunteers for making this event a success! And don’t forget to contact us if you are interested in participating in our next event!